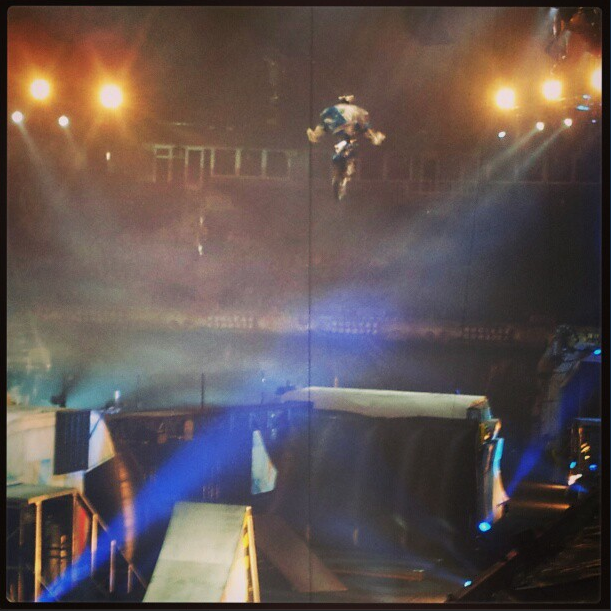 The Nuclear Cowboyz were once again at the Sprint Center in Kansas City this past weekend. 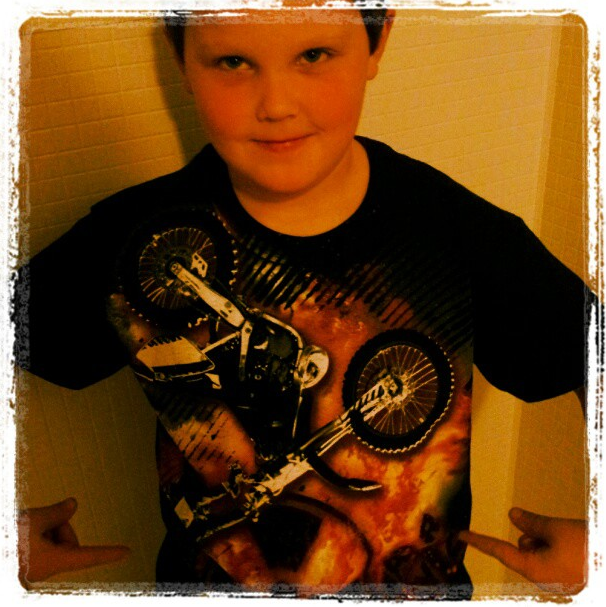 My son loves riding his dirt bike and is always talking about doing tricks on it. Of course, being his Mom I’m quite worried about him and he always says I’m just freaking out about it. 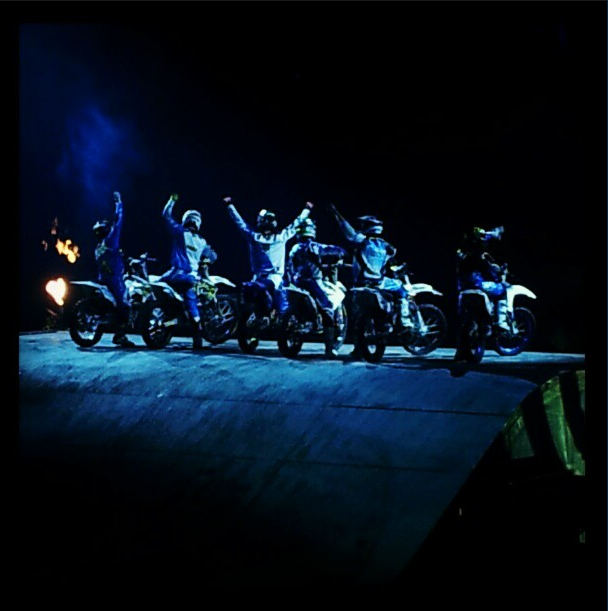 If you aren’t familiar with the Nuclear Cowboyz, it’s a FMX tour with a unique futuristic style story and awesome freestyle motocross tricks. I snapped several pictures during the event but sadly they didn’t turn out well due to the smoke and lights. I do post all pictures during events to our twitter and instagram so be sure you are following us on there. Tickets were $32 for adults and $10 for kids if you didn’t want to sit in the nose bleeds. I didn’t think these prices were too bad until they added the facility fee, convenience fee, delivery fee and taxes. I mean how many fees can they have? I kid you not, the total I paid in fees after the tickets was a whopping $51.98! I know, I’m complaining about it but we still paid it. Plus, we live a few hours from the city so it’s a day full of spending. The story was very futuristic with two tribes of riders taking place in Los Angeles during the year 2150. They are suddenly threatened by an evil force, The Tempest with her own army. They also have some great dancers and in the end the two tribes take over the Tempest. It was cute and very good. My son loved it and we intend on going back next year. The show lasted about two hours. Of course, we couldn’t leave before buying a few $30 t-shirts. My son is modeling his below. He just had to wear it to school today. I tried to explain to him that it wasn’t okay to wear a t-shirt to school in ten degree weather but he insisted so I bundled him up in more layers. We really wanted to get the Nuclear Cowboyz autographs at the end but the line was so long and we had a long drive back home so sadly we didn’t wait. Giveaway Bandit is in no way associate with Nuclear Cowboyz. Sometimes us moms have to do what we have to do to make our kids happy. Sounds like you made his day and a memory to cherish. Wow! It looks like it was an exciting day for your family. 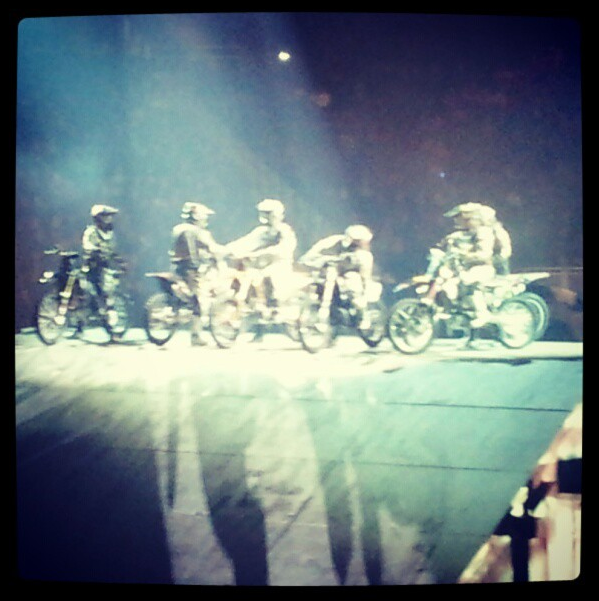 The riders look like they are real dare devils! It looks like a great show to see, but those fees are ridiculous! They should be more upfront about the cost! Wow!! My son would LOVE this!! Looks like you had a great time! Thanks for the review!! My son is almost 3 and he would love this, but my nephew would go crazy for a show like that! How exciting. That looks SUPER fun! I am going to have to show this to my son. He will love it! I’m not sure I’d like this but I know my boys would have a BLAST! My boys would love to see them. So cool.